Join our upscale Northern Italy escorted tour in small groups. Tour and experience the best of Northern Italy and the chic Swiss town of Lugano. This upscale Italy escorted tour has something to offer everyone, whether your passion is fine wine, art, food, fashion, architecture or history. Traveling the countryside through the posh Lombardy and Veneto regions, you’ll feast on local specialties and enjoy their unique landscapes, architecture and history. You’ll see wonderful villas and vistas around the beautiful Lake Lugano, Lake Como and Lake Garda with free time to enjoy the lively shops and cafes on their shores. Private transportation to and from the airports – arrival and departure days. Services of a tour director. NOTE: Arrive early or depart later. We’ll make all the arrangements for you. OPTIONAL TOUR EXTENSIONS: 2 or 3 days in Florence or Rome or Venice. Let us know what you have in mind. After breakfast, our Northern Italy escorted tour starts a guided tour Villa Balbianello. One of the most beautiful sites fronting Lake Como, this famous villa was used as a setting in a number of films including James Bond’s Casino Royale. After the tour, you will take a boat ride to Bellagio, one of the prettiest village in all of Italy. Bellagio sits in front of Lake Como with its promenade, stairways and streets from the bottom to the top, lined with shops, restaurants, bars and cafes. We’ll make sure we have some free time to explore on our own and to have lunch. As always, your tour director is available, if you want company. You may want to visit Villa Melzi’s beautiful garden which faces the lake. Today, our Northern Italy escorted tour includes Lugano, Switzerland, a short trek from Como. This upscale Italian-speaking Swiss town of Lugano is situated on Lake Lugano. We will have plenty time to explore the town’s treasure like the Chiesa di Santa Maria degli Angioli, a simple Romanesque church with 2 frescoes from 1529 by Bernardino Luini. Lugano is also a favorite vacation spots of wealthy Europeans. There are plenty of upscale shops all around. Our Northern Italy escorted tour also takes us to Milan, where we will spend the next two nights. You will have a guided tour, starting with the city’s magnificent late Gothic cathedral. Our tour of Milan also takes us to La Scala, one of the world’s most famous opera houses, where a resident staff takes us on a private behind the scene tour of this famed theater. Our escorted Italy tour takes us to Bergamo before proceeding to Verona, our final destination. Bergamo is ancient dating back to pre-historic times. Bergamo was founded by the Gauls, followed by a long list of conquerors in earlier times that included the Etruscans, the Romans and the Longobards. Now, the city is divided in two, the upper part of town called Bergamo Alta and the newer and lower called Bergamo Bassa. The city is rich in artistic treasures as we will see in its collection of palaces, mansions, churches and monuments. 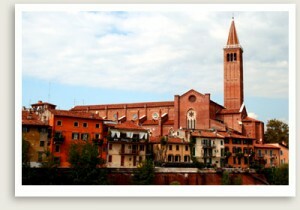 We’ll tour this beautiful city, have lunch on our own and have some free time to explore before we proceed to Verona. An amazing city in every sense, beautiful Verona has plenty of historical monuments and ancient sites that date back two thousand years. Verona’s sights include a famous Amphitheatre and Roman Theatre; Castelvecchio and Scaligero bridge; Gavi’s Triumphal Arch, Piazza delle Erbe with a fountain dating back to the mid 1300s and monumental gateways that greet visitors and depict the grandeur of the Roman empire. Our expert guide will lead the walking tour of Verona’s main historical highlights. The Della Scala family who once ruled Verona transformed the city’s appearance forever with its castles, fortifications, palaces and squares and last but not least, their splendid and intricate funerary monuments, the Arche Scaligere. Today, we explore the Valpolicella region, Sirmione and Lake Garda, the largest lake in Italy. You will enjoy a breathtaking drive along Lake Garda’s shores, lined with wildflowers, cypress and pine trees, and olive and lemon groves. The lake is a quite popular during the summer, and the towns flanking it boast many popular holiday resorts. We’ll also go and explore Sirmione, set along a narrow peninsula on the southern portion of the lake. There are many interesting historical sights to visit here, including the 13th century Scaliger castle (Rocca Scaligera) built as part of a defense network surrounding Verona. Next to the castle is the 12th century Sant’Anna della Rocca church with well-preserved frescoes. We’ll also enjoy strolling the town, and perhaps stopping in on some of its numerous cafes, bars and local shops. Our Italy escorted tours always include wine tasting. We’ll visit a family-run winery located in the area of Paverno, in the heart of the historic Valpolicella region. The family is a serious wine producers devoted to producing quality wine. Group lunch is planned. 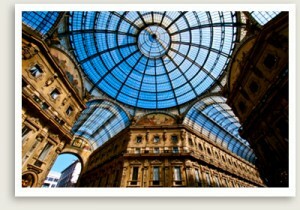 NOTE: Inquire about an optional tour 2-day tour Florence or Rome and extra nights in Como. We specialize in customized tours so we can accommodate any of your travel preferences. 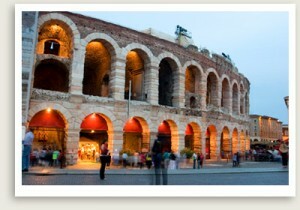 Please have a look at our other Italy escorted tours.